Summer is here and Roka Akor Scottsdale is partnering with Live Nation to provide guests a Japanese-inspired dinner, as well as a complimentary concert to see today’s hottest artists, such as Wiz Khalifa, Fifth Harmony, and Def Leppard, among others. Guests who dine at Roka Akor Scottsdale for their signature “omakase” experience the week of the concert will receive box seats to the concert of their choice. Roka Akor Scottsdale’s one-of-a-kind “omakase” experience, which means “to entrust the chef”, includes a personalized tasting menu prepared with rare and premium in-house ingredients and incorporates steak, seafood, and sushi. After an incredible feast at Roka Akor, guests can head to their chosen concert at Ak-Chin Pavilion, where they will have access to prime location box suites and seats, VIP parking, private VIP entrance, and the VIP Club, exclusively catered by Roka Akor. **Note reservation/dining requirements** Roka Akor’s “omakase” dinner reservations are $150 per person plus tax and gratuity, and reservations are required in order to the receive Live Nation concert tickets. Guests must make their reservations and dine with Roka Akor prior to attending the concert. Concert tickets are limited to three pairs (six tickets total) per concert and are subject to availability. Reservations can be purchased by calling the restaurant at 408.306.8800 or emailing Scottsdale@RokaAkor.com. 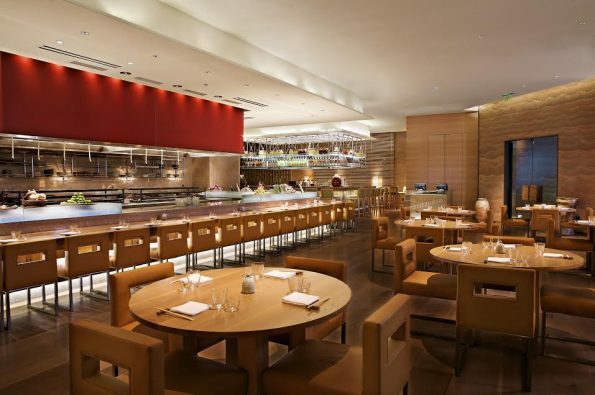 Roka Akor brings an unparalleled combination of thoughtful design and contemporary Robata Japanese cuisine to four locations across the U.S., including Scottsdale, AZ, San Francisco, and Chicago and Skokie, IL. The restaurant’s name is derived from two words: RO and KA. The meaning of the first word is hearth, a gathering place where people socialize and take in the ambience; the latter stands for a burning fire and projecting energy. Managed by JNK Concepts, Roka Akor’s menu changes seasonally, including a rotating selection of prime-cut steaks, seafood, and vegetables with Japanese-inspired marinades and sauces, along with sushi and sashimi. The restaurant’s design features a centrally located robata grill that provides the heart of the visual experience, surrounded by rich wood décor and sleek lighting.